I've been trying to be intentional about my thought processes this week, this Holy Week. I've tried to slow down and give pause. I've found myself identifying more with the crowd instead of Mary, which pains my heart deeply, and yet, I know there is grace. The crowd wasn't satisfied with how Jesus was coming to fulfill the prophecy. They hung Him on a cross because they didn't get what they wanted. Today, for whatever reason, I have not been satisfied, I have not been content with the gifts that God has given me. I've been busy looking at other people. I've been wondering, "Why haven't You?" And yet, here I am sitting in a space for which I have asked and I'm asking when He is going to move me again. I may not be physically crucifying Him, but I am nailing Him to the cross again with my words of malcontent. All today, my eyes keep finding this rose bush that I have in my backyard. It is dripping with blooms, abundant and full in ways that it has never been before. It has suffered through the worst drought and yet, here it is in all its glory, blooming. See the abundance, He whispers. Take in the abundance, the bush screams at me. It's a pace of slow and I want to go fast. It's a time of watering deep and I just want a sip from the hose. It's a time of uprooting those things that I've clung to for too long and I just want to lop off the head. I want to be different, but really, this just makes me the same as everybody else. And my heart is heavy, but I can turn this way or that way. I can drip with discontent or I can gush joy. I can lament the sad state of my heart or I can revel in the state of His. I can make this all about me, or I can make it all about Him. And so, today, I turn. And I will see. Beautifully said. And what a poignant example that bush is. This is so lovely. Thank you. I want to take my time for Him and for others as well. the smile of the Burning-Bush Dweller. I love the bush screaming...how sweet of God to give these moments...blessings to you as you hear His love all around you. This is beautiful...beautiful post and beautiful pictures. A screaming bush... yes, I need those, too. Seems I fail to hear Him whisper from the blades of grass and dirt beneath my feet far too often. I feel your longing, your restlessness. Many days, I'm with you in the crowd-- but longing to be Mary who ponders these things in her heart and walks in faith when nothing makes sense. Love your honesty. Praying Easter joy over you, my friend. I really get this, Jen. I am in the crowd too at times. It is so easy to be there with the rest except that we don't want to be there. Those "crowd moments" are the places God has to scream (how else would we hear). So thankful for the bush that survived the drought. Haven't we all? Yes, we must make it all about Him! Have a blessed Resurrection Day! We ask, yet are still discontented. You speak for so many of us with this one simple reflection. Thanks for piercing the fog of our selfish thoughts and lighting the way. Discontent is such a sad sin...we have so much but it is not enough or the right stuff or not in the right time. I feel Paul's frustration: That which I do not want to do I do. It is all faith. Lord, help me with my unbelief! And yet, today is here. Passover, Good Friday, our sweet Lord breaking His bread, His body with both hands. And then He has risen. May I learn and see the Rose of my LORD in this beauty and not in my distractions, my personal sorrows and trials, my pain, my own needs. May I feel the loss of my LORD this Friday of Easter weekend, not my own. 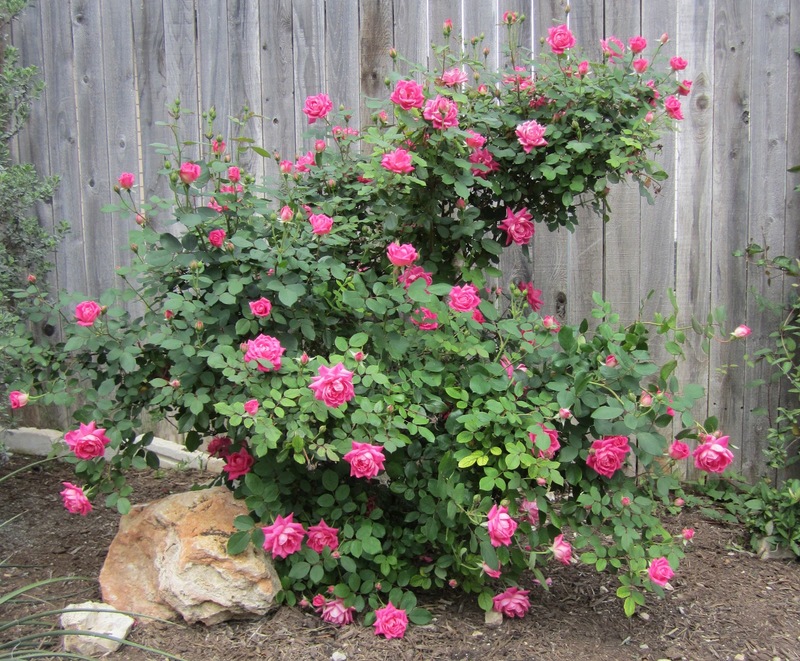 May I see these roses abundantly blooming through our Texas drought and harsh weather. May I see and feel Jesus dying for me today. May I respond with grief and loss, not fear and running. May I love because He loved me first. And may I give thanks for all He has done for me, is doing, and will do for always. Thank you, Jen, for words that instill pondering for me this day. Oh yes, Jen, yes. I am so that crowd sometimes -- wanting what I want, when I want it, my way and not God's. Powerful reminder here, thanks! What an incredible post. Just the words I needed to hear. Taking a sabbath today...and seeing just how MUCH I need to slow down & rest, and just how HARD it is for me to do that! You've seen the bush afire with God, the one that Elizabeth Barrett Browning talks about. And you're pointing it out now, to the rest of us. I feel like I ought to take off my shoes, friend. Beautiful thoughts on a blessed Easter! I have been tempted recently by malcontent. It is so easy to focus on what I don't have and to not be thankful for what I do. When I consider where I came from, I should do nothing but give thanks! Thank you for the honest and gracious reminder!